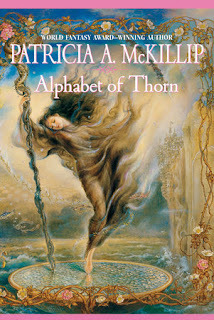 For our second quarter's book club, we read Alphabet of Thorn by Patricia A. McKillip. Here's what I thought! Alphabet of Thorn follows sixteen year-old Nepenthe, an orphan whose been raised by the Royal Librarians of Raine. Under their care she's become a master translator of books and ancient texts and then one day, a young mage gives her a book that no one can translate. It's written in a language of thorns and soon it becomes an obsession. Something about the text just calls to her and she wisely chooses not to ignore that feeling. As she begins to discover the book's contents, her life becomes intertwined with the young mage who gave it to her, the newly crowned Queen of Raine and the secrets that begin unfold along the way. It's fantasy with a sometimes heavy dose of romance and I'd be lying if I didn't admit the latter was probably what I looked forward to the most. The world was definitely a bit confusing at first, as was the storytelling style the author employed but once I got a handle on both, I was intrigued. I enjoyed Nepenthe's character from the start, her thirst for knowledge probably being my favorite quality about her. The more she uncovered about the book, the more I wanted to know how it would all end. Likewise, the more I saw of the romance, the more time I wished we had more time with Nepenthe and this guy whose name I can't tell you! But I will say that even though it's insta-lovey, I shipped it completely. Overall, the book is a surprisingly quick read and engaging once the story gets clearer. I enjoyed it but I didn't fall in love with it as much as I hoped I would. Favorite character | Nepenthe and the mage. Would you read more from this author? | Yes! I felt this was a good introduction to her work and I'm interested in reading more in the future. Even though I was definitely confused at the beginning, I certainly got really into the story the further into it I read. It was a very different sort of fantasy from the ones I normally gravitate towards, and that's not a bad thing!